I have been growing sprouts at home for several months now. I have tried three different kinds (alfalfa, brassica blends, and radish sprout.) It takes time to get used to remember watering and draining two times a day, but it is very convenient to have fresh vegetable at home at any time. 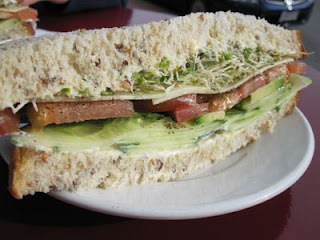 One of the reasons I started to grow the sprouts was the sandwich from the Savary Island Pie Company (http://www3.telus.net/sipco/). Their veggie sandwich is the best sandwich I ever had. 90% of the taste may come from their bread, but the ingredients are very fresh and crispy too. Since this sandwich is quite pricey, I decided to imitate it. (I think the price is fair, as they use good (many of them are organic.) ingredients, and their breads are great. But I can't afford it every day.) I could buy sprout at supermarkets, but I decided to grow. Then I found a Canadian family business (http://www.sprouting.com/) carries all I needed. They have nice varieties of seeds and sprouters, and delivery is fast. So now I have sprouts in my refrigerator most of time. One of the dish I make often is "sae-ssak bibimbap." This is very simple dish but refreshing and yummy. 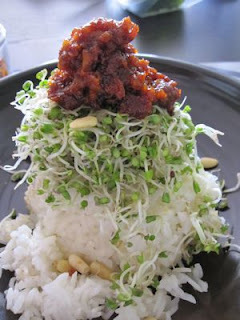 First, you have to prepare the rice, and make "yak gochujang." 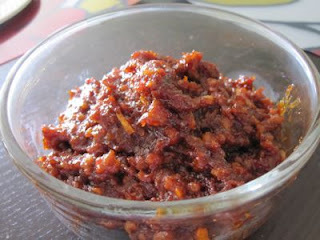 Gochujang is Korean spicy hot soybean paste. There are lots of brands, but I use this one which made without GMO beans. 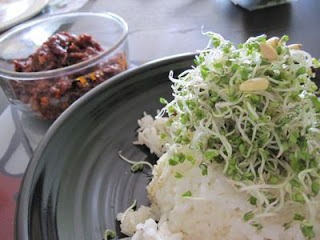 On the dish, put cooked rice and sprouts. If you have, pine nuts make good garnish. And I miss the Savary Island Pie Company sandwiches. Ange: we can go when you come back. I was thinking of you yesterday as I went to Thomas Haas. Ah, sprouts. We'll have to try making this dish some time. It looks pretty great. Glad to see you blogging again. Hurray! the enthusiasts: I almost emailed you to let you know about my posting, haha.